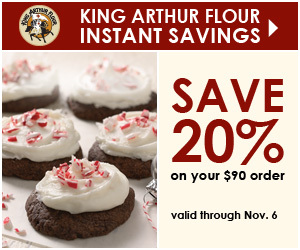 I'm usually not big on the coupon/discount bandwagon, but I'm a huuuuuge fan of King Arthur Flour, so I had to pass this one along. And it's particularly timely. Holiday baking season is almost here. Yeah, you can buy flour at the grocery store, but King Arthur Flour's catalog always has crazy new stuff that I absolutely have to try. Last year I fell in love with red white and green sugar pearls. I baked cookies just for an excuse to use those things. This year, I haven't quite figured out what my indulgence will be, but I'm sure I'll find something I can't live without. And then something else. And something else. If you're in the same boat with me, there's a 20% off discount when you spend $90 or more through November 6. For me, that's easy. Meanwhile, for something completely unrelated, I was at Whole Foods today and thought these employee Halloween costumes were pretty funny. Clearly, all that good food has had some tragic consequences for this employee's teeth and hair. It's sad, really. As you can see, this employee has suffered a bullet wound to the head that should have been fatal, but she didn't even seem to have a headache. Or maybe she's on her way to becoming a zombie. Either way, it's clear that "natural" liquor must be very good for you. When the weather gets cooler, I get more exited about baking and I start thinking about baked desserts. Much of the time, that means cookies. One cookie is a perfect serving size - no need to slice a cake. And cookies tend to have a longer shelf life than cakes or pies because they're less moist. That's a big selling point around my house since there are only two of us. Cookies are also easy to give away in small quantities. A couple cookies is a nice gesture and they're easy to transport and serve. It's a little harder to plate up a slice of cake to give to someone. And if you’re sharing with multiple someones, slicing and serving cake requires forks and plates for everyone. Cookies are finger foods. While you're at it, a cookie or two is a nice, transportable snack. You know, if you're not interested in sharing the wealth. There have been some concerns lately about the peanut crop and the possible rise in the price of peanut butter, so I thought I'd use a different nut. But instead of a nut butter, I used a nut flour. Almond flour is easy to find these days, but you could make your own, if you wanted to. It's just finely-ground nuts - but not ground so much that it becomes a paste. As far as the sugar, lately I've become a fan of evaporated cane sugar. It's the stuff that's not quite white - a very pale brown. It's got a slight molasses flavor, but not as strong as light brown sugar. And since it's not as wet as brown sugar, it pours and measures like granulated sugar. If you don't have evaporated cane sugar, you can use white sugar or half white sugar and half brown sugar. Are these cookies smiling at me? Line a baking sheet with parchment paper and preheat the oven to 375 degrees. In a large bowl, cream the butter and sugar. Add the almond extract, vanilla extract, and egg. Beat until it is well mixed. In a separate bowl, combine the almond flour, all purpose flour, baking powder, and salt. Whisk to combine. Add this dry mixture to the wet, and mix with a wooden spoon until combined. Add the chocolate chips and mix until well distributed. Bake at 375 degrees until the cookies are barely browned on top (they will brown a little more on the bottom) about 11 minutes. Let the cookies cool for a few minutes on the baking sheet before moving them to a rack to cool completely. I haven't attended a whole lot of blogger events. Either I have something else to do, or the product doesn't appeal. See, the thing is that once you attend an event, you're sort of expected to blog about it. Since I write honestly about my experiences, there's no way I want to be obligated to write about something I don't like. As much as I might get my snark out of its box in other situations, I see no reason to cranky-post about products I don't like. Because really, if I hate your favorite brand of barbecue sauce, who cares? It's a matter of personal taste. If I don't like something, I prefer to not write about it at all. So, no, you won't see a lot of negative posts here. Because I'd much rather write about things that I like. I mean, if I have an appliance that falls apart upon first use, then that's something I might point out. Because it's factual. But "eeewwwww, I would never use THAT brand of mayonnaise" isn't something I'd be likely to post. I might tell you which one I like best*, but I'm not going to hate on the ones I don't care for. Or at least not by brand name. But I digress... this is about dinner, right? 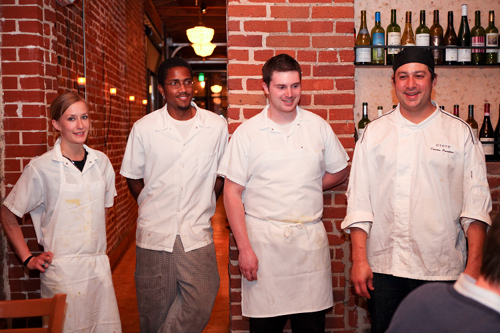 So, when Barb from Creative Culinary invited me to a dinner sponsored by an olive oil company, it was a slam dunk. I go through olive oil like it grows on trees. And I like trying different brands. And although I've had some I've liked better than others for specific purposes, I don't think I've ever run across an olive oil that I flat-out didn't like. With no other plans in my schedule and a pretty sure bet that I'd like the product, I accepted the invite. The venue, Ototo in Denver, was new to me. I don't go into Denver very often. Not that I have anything against Denver - it's just that I'm more likely to hang around closer to home. But this seemed like a good reason to spend some quality time in my car, singing off-key along with the radio on the way to a dinner with friends I'd never met. You see, Barb and I had emailed and tweeted so often, I felt like I knew her. But this was the first time I met her in person. So off I went, to uncharted territory in Denver. As I drove, I couldn't help but think that cities of a certain size all seem to have similarities. It's like the same people laid down plans for the streets and the highways and the houses and the neighborhoods all over the country. One curve of highway reminded me of another in a different city, and one block of stores reminded me of yet another city. And finally I was there. The layout of the restaurant reminded me of Salt, in Boulder. It was deja vu all night long. Dinner started with bread and dipping oils - one with rosemary and one with basil. 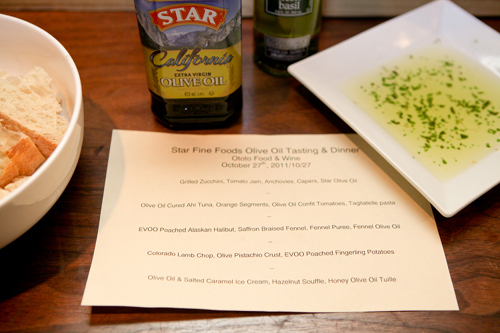 Yup, since the event was sponsored by STAR Fine Foods, makers of STAR olive oil (and other products) every course had olive oil incorporated. 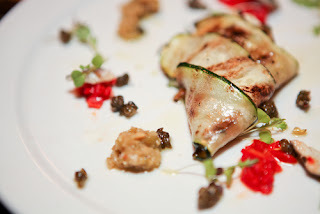 The first course was a grilled zucchini with tomato jam, anchovies, capers, and olive oil. The interesting thing about the zucchini wrapped around chevre (besides the fact that it was really pretty on the plate) was that for some reason I expected it to be a cold dish. Instead, it was warm and sort of comforting which was particularly nice since there was snow outside. The tomato jam packed a whole lot of flavor into tiny bites. Second was ahi tuna cured in olive oil. 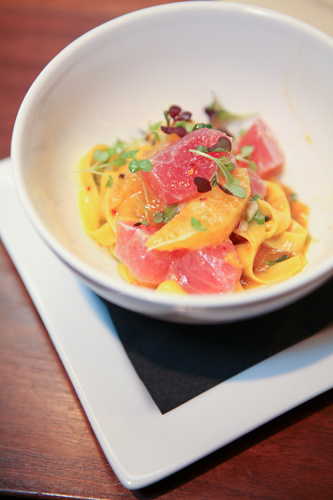 It was served on tagliatelle pasta and had segments of orange and an olive oil confit of tomatoes. The colors are really pretty, aren't they? The flavors of the tuna and oranges complimented each other well, and the pasta was darned good, too. I could go for a bowl of that stuff right now. Third was an Alaskan halibut poached in extra virgin olive oil, with pretty yellow-orange fennel that took on its color from being poached in saffron. It came with a fennel puree and fennel olive oil. That sounds like a lot of fennel on one plate, but it wasn't overwhelming. 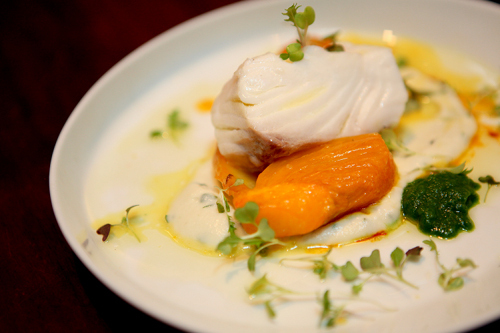 The saffron-poached fennel was amazing for its color alone, and it made the stark-white halibut really pop. And the halibut was amazingly moist and tender. I've never poached fish in olive oil, but I think I need to try it. Soon. Next came the dish that had everyone at our table oohing and aahing. 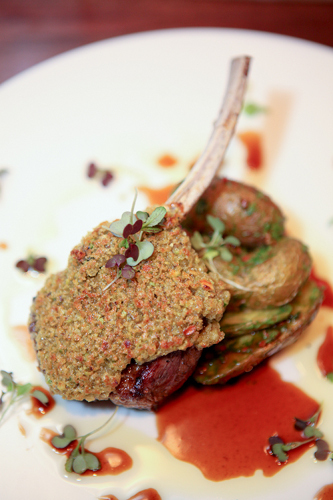 It was a Colorado lamb chop with an olive pistachio crust. Here's the tricky thing about that crust. The lamb chop wasn't crusted and then cooked. Oh, no. Instead, the crust was made separately as sort of a disk, and that was put on top of the cooked lamb chop and then briefly broiled to melt the crust onto the chop. Okay, there's another technique I'm going to play around with. It has all sorts of possibilities. And (bonus!) the chef gave us the recipe. All good things must come to and end, and for us that meant an olive oil and salted caramel ice cream with a hazelnut souffle and a honey olive oil tuille. You might notice that the quality of this last photo isn't quite the same as the previous ones. That's because a professional photographer with a mighty fine camera took the rest of them for us to use. And of course he positioned himself for the best light possible. The dessert photo is from my little point-and-shoot camera, taken right at the table. It gets the point across, though. The ice cream was amazing, the tuille was crisp and crunchy, and the souffle was soft and warm. This was paired with a sweet dessert wine - Strev Moscato D'Asti from Italy. Ahhhhh.... so good. I like dessert wines. So there we had it, an entire meal focused around olive oils. But seriously, I use a lot of olive oil in cooking without really thinking about it. 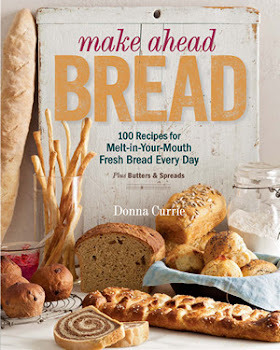 For cooking, on salads, brushed on bread before toasting in the oven, for making croutons, in bread, drizzled, splashed, and dashed just about everywhere. But with this meal, I think we were more conscious of the oil as a star ingredient in each dish. Or as an ingredient by STAR. Did I taste it everywhere it was mentioned? Honestly, no. But that's fine. It's not always about taste. I'm sure that each course would have been much different without the oil. It played its role, and did it well. As far as the actual taste of the oils STAR produces... well, stay tuned for that. 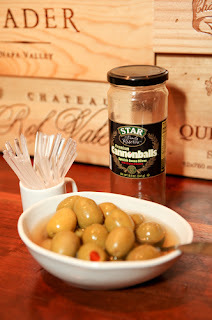 We each left the venue with a goodie bag with olive oil and some olives. I need to pick up a few more things and I'll be having my own little olive oil tasting at home so I can tell you about the differences between the different types of olive oil. Probably not all of them because they make quite a few varieties. But there will be a few. Disclaimer: I was fed for free and received samples of the products after the event; I was not required to post about it and was not paid to post. The opinions expressed here are all mine, or as forced upon me by the voices in my head. Does anyone really read disclaimers? Just checking. *Hellmann's (or Best Foods, depending on geography). 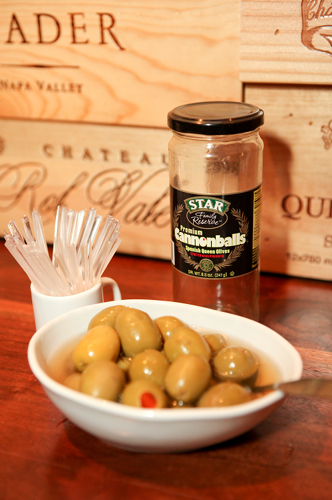 In this case the product was Monte Olivares Olive Oil. I use plenty of olive oil. It's my oil of choice for everything except high heat frying. But it's seldom the star of the dish. This time, olive oil needed to be the star - it was the ingredient I got from Fooducopia to write about. I briefly considered salad dressing, since it's a major component. But in salad dressing, most of what you taste is the vinegar and then the spices. No, I needed a recipe where you could taste the olive oil - to savor it. I considered an olive oil cake. I considered a few other things. Finally I hit on the perfect thing. Dipping oil. You knows those oils that you get at restaurants for dipping bread? They're a great alternative to butter - probably healthier. And they're easy to make. I suggest that you make this at least a little bit in advance. You want the flavor of the shallot (or garlic, if that's what you use) to mellow a bit, and you want to give the herbs a little time to hydrate. I've had dipping oils that are ALL oil with herbs added, but I think a small amount of vinegar cuts the richness of the oil nicely. I've also seen recipes that have so much vinegar that they're simply salad dressing in a bowl. That's a little too much. To me, the vinegar should be an accent. Just enough to tickle the end of the bread when you dip it in, but much more than that. I used a shallot when I made this - I like the oniony-garlic flavor. But you could use garlic instead. And I completely lazed out with the herbs. I used an Italian herb mix that included marjoram, basil, oregano, thyme, rosemary, and oregano. You could use any mix you have on hand, or combine individual spices to make your own mix. Combine the shallot, herbs, and vinegar in a small container or your dipping bowl. Let it sit at least 15 minutes for the herbs to hydrate. Add the oil. Serve with slices or chunks of baguettes for dipping. You can make this a day or more in advance. The longer it sits, the more the onion or garlic will mellow. You can make larger quantities of this well ahead of time. If you give it a good shake, it will emulsify briefly so you can portion it into dipping bowls. After it sits for a few minutes, it will separate into layers again. *If you're using a commercial herb mix, read the label to see if salt is included. If it is, you probably won't want to add any more. Baked beans - real baked beans - are nothing like the baked beans you can buy in cans. Not at all. The great thing about making your own baked beans is that you can add special ingredients that make your baked beans unlike what anyone else makes. Or, you know, just borrow this recipe. Because it's pretty darned good. Besides the usual molasses and tomato product, these beans include maple and bourbon. Baked beans are great at any large gathering, since they're economical to make in large quantities, they reheat well, they're pretty hard to overcook, so you you leave them on low in a crockpot for serving, and people will think you're a genius if you make your own. There are some traditional beans used for baked beans, but truthfully you wan use whatever you like. The cooking time will change if you use larger beans, and the color could be different if you use dark beans. But you still have a lot of options. I used an heirloom variety of beans that were a mottled yellow and white that I bought in the bulk sections. Soak the beans overnight in a sufficient quantity of water to cover the beans several times their volume. The next day, drain the beans and rinse. Put the beans in your slow cooker, add 1 teaspoon of salt, and enough water to cover the beans by a few inches. Cook on low until the beans are fully cooked - 8-12 hours, depending on the beans and your crockpot. Drain the beans, reserving a cup or two of the cooking liquid. Put the cooked beans into a Dutch oven and add the bacon, onion, celery, ketchup, molasses, maple syrup, and bourbon. Add about a cup of the cooking liquid. Cover the Dutch oven and put it in your preheated oven. Cook at 325 degrees until the vegetables and bacon are cooked and the beans have absorbed the flavors - about 2 1/2 hours. Add more of the bean cooking liquid or water, as needed, to keep the beans moist. You don't want the soupy, but they should stay moist. It's that time of year, isn't it? No, I don't mean the holidays that are rapidly approaching. Not quite. And I don't mean cold weather, either, although that's sort of related. What I mean is comfort food potluck season. In the summer, it's barbecue-style potlucks. But now it's about bringing comforting foods foods, whether it's for a family gathering or an office party, or a get-together with neighbors. Main dish, side dish, or dessert, these recipes will get you through the events in style. And to keep these from being too ridiculously long, I've made each recipe its own post. First up - right here - is a chicken and turkey pie - a hearty and homey main dish. In the next post is a baked bean recipe for those parties where you need to bring a side dish. Last, there's cheesecake. When I was a kid, my mom wasn't a big fan of convenience foods. But every once in a while she relented and bought one of my favorite things - pot pies. I wasn't fond of the beef pot pies, but I loved both the chicken and turkey pot pies. When mom made chicken, it was usually roasted. And turkeys were for Thanksgiving. The idea of cut up bits of chicken or turkey in a sauce was something different, and that made it appealing. And as a kid, eating pie for dinner was a plus. Later, I learned about different kinds of dinner-worthy pies, like shepherd's pie. This poultry pie is a combination of those two ideas, with a chicken and turkey filling like the pot pies I loved so much, and a potato topping like shepherd's pie. But of course, that's not enough of a twist. I didn't use white potatoes for the topping - oh no, I went for sweet potatoes, for a brilliant pop of color. This can be made ahead of time and assembled and reheated just before serving. And if you don't care for sweet potatoes? Sure, you could use white potatoes. Or serve this over rice or noodles, if you prefer. Heat the olive oil in a heavy bottomed pot on medium-high heat - a cast iron dutch oven is perfect. Brown the chicken and turkey on all sides. You might need to do this in several batches, depending on the size of your pan - you don't want to crowd the pieces. When the chicken is browned all sided, remove it from the pan and set aside. Add the carrots, celery, onions, and salt. Lower the heat to medium and add 1/2 cup of water. Cook, stirring as needed, until the water has just about cooked out. Add the mushrooms and thyme and continue cooking, stirring as needed to prevent the vegetables from sticking to the bottom of the pot and burning. When the liquid is cooked out, add the flour and stir until it has coated the vegetables and you don't see any dry bits of flour any more. Add 2 cups of water and bring to a boil, then reduce to a simmer. Cook until the carrots are fork-tender - about 15 more minutes, depending on the thickness of the carrots. Add the peas and corn. Add the chicken back to the pot. Stir in the cream. Meanwhile, cook the sweet potatoes. The easiest way is to poke them a few times with a fork and microwave until tender. Or, if you prefer, roast them. When they're done, scoop the flesh out, put it in a bowl, and add the butter and a pinch of salt. Mash - or if you prefer a smoother puree, blend with a stick blender. transfer the potatoes to a pastry bag fitted with your preferred tip, or to a zip-top plastic bag with one corner snipped off. Portion the chicken mixture into individual serving containers and top with a border of the sweet potatoes. If you prefer, you can serve this family-style from a larger serving bowl. See this page for information about Whole Foods Friday. I like to keep a few things on hand that I can cook quickly when I'm pressed for time, and for sure shrimp is one of those things. Every once in a while it's on sale, frozen, so I'll pick up a bag and stash it for when I need it. Unlike a steak or roast, shrimp thaws quickly, so you don't have to plan very far ahead. Pull them out of the freezer, put them in a bowl with some cold water, and let them rest in the refrigerator while you prep everything else, and they'll be ready to cook when you're done. And if you're really in a hurry, you can thaw them under cold running water. Lately I've been paying a lot more attention the the country of origin for seafood. I'm not saying I won't buy anything that isn't from the US, but there are some countries that I prefer not to buy seafood from. In this recipe the radicchio is all about the color. The pop of purple is nice. If you don't have any on hand, don't worry about it. Sprinkle the shrimp with the salt and red pepper flakes and set aside while you heat the oil in a wok or frying pan. When the oil is hot, but not smoking, add the onion and pepper and stir fry until they just begin to soften, then add the shrimp and the sherry or rice wine. Stir fry a few moments, then add the zucchini and yellow squash. When the shrimp is just barely done, add the radicchio, give it a quick stir, and transfer to a serving bowl. I served mind with rice that was cooked with a pinch of saffron - plain white rice is fine. Holidays are creeping up, and that means a few things. First, the weather is getting much more conducive for baking. And second, there are a lot of new cookbooks coming out, just in time to get on your Christmas shopping list - or your own wishlist. When those two things combine, it means one thing: I'm going to be trying some brand new baking recipes. 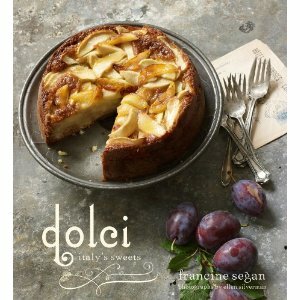 I got a review copy of Dolci Italy's Sweets from the publisher and I browsed through it looking for something different to make. I almost decided on making biscotti.- the recipe looked interesting because it included vin santo, and Italian dessert wine. But then I saw a recipe for vanilla cookies. It was intriguing. Okay, vanilla cookies might not sound all that intriguing, but there was one ingredient in there that I've never used in cookies, and that was enough to steer me to this recipe. The secret special ingredient? Egg yolks. But not just ANY egg yolks. This one uses cooked egg yolks. I've never - ever - ever seen cooked egg yolks used in a recipe before. I had to try it. The result? These cookies have a very distinct vanilla flavor and fine crumbly texture so the sort of collapse when you chew. These would be a great addition to the Christmas cookie tray. Combine the cooked egg yolk and sugar in a food processor and process until smooth. Add the butter and process until creamy. Add the cornstarch and vanilla and pulse until combined. Add the flour and pulse again until just combined - don't overprocess. Pinch off bits of dough and roll then into 1/2 in balls. Arrange them on the prepared sheets. Press down gently in the center of the ball to flatten the balls and make a little divot. Place the sheets in the refrigerator for 10 minutes to firm up the dough. Bake at 325 for 20 minutes - the cookies should be dry to the touch, but they will still be light in color. Let the cookies cool completely on the baking sheets - they are very fragile when they're warm. Serve plain, or dust with powdered sugar. Or, if you like fill the divots with a bit of jam or melted chocolate. With Halloween rapidly approaching, I decided to do a theme recipe. At first I considered something in black and orange. Or spider-shaped. Or ghost-like. But, no, I decided to make bones. It's a simple idea. Make dough, tie ends in a knot, and you've got bones. They look sort of like the rawhides they sell for dogs. That wasn't enough. I wanted some marrow in my bones. Oh, yeah, that's a lot more fun, isn't it? Who doesn't like a little surprise inside their bones, right? I've been a little enamored with cane sugar lately, so that's what I used here. Plain old white sugar would be fine. If you don't happen to have almond flour around, chop or grind any nuts you like until you have a crumbly dry finely chopped product. Don't grind all the way until you have a paste, though. Combine the yeast, flour, and 3 tablespoons of sugar, and water in the bowl of your stand mixer. Knead with the dough hook until the dough becomes elastic. Add the salt and butter and continue kneading until both are incorporated and you have a smooth, soft, elastic dough. Cover with plastic wrap and set aside until doubled in size, about 45 minutes. In a small bowl, combine the almond flour, the remaining tablespoon of sugar, and the cinnamon. Stir to combine. Line 2 baking sheets with parchment paper and preheat the oven to 325 degrees. Flour your work surface and turn out the dough. For ease of handling divide it in half. Roll half of the dough into a rectangle about 12 x 10 inches. Cut the dough into 4 strips, 3 inches wide by 10 inches long. Do the same with the second piece of dough. Distribute the almond mixture lengthwise down the center of each strip of dough, stopping just short of the ends. Fold the dough over the almond mixture and seal the seam and the ends so you have a rope about 10 inches long. Pick the rope up and squeeze it from one end to the other so the dough is firmly around the filling with no big air bubbles, and it's somewhat evenly thick from end to end. This will probably result in the rope lengthening a bit, to about 12 inches long. That's fine. Tie a knot in each end of the rope and place the ropes on the prepared baking sheets. In theory they would all fit on one sheet, but you don't want them touching during the baking, so use a second sheet to give them plenty of space. Cover the sheets with plastic wrap and set aside to rise until doubled in size, about 30 minutes. Remove the plastic wrap and bake at 325 until the bones are a light golden brown, about 25 minutes. Remove the bones from the baking sheet and let cool on a rack. This has been submitting to Yeastspotting. If you like bread, check out their roundups every Friday. I love it when one of my preconceived notions gets ground into dust. Just about every French onion soup I've ever eaten has been made with beef stock. Okay, some of the less-good ones started with bouillon cubes or canned stock. But it seems like there's always beef involved. Okay, perhaps chicken. But that always seems wrong. 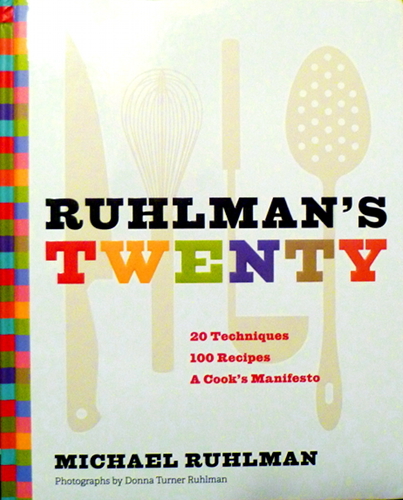 When I got Michael Ruhlman's book Ruhlman's Twenty, I was shocked to see that his French onion soup didn't start with beef stock. Not even chicken. Nope, only onions. Not that long ago, I had no idea who Michael Ruhlman was. Later, I knew him as someone that other people talked about. Then I found out that he really knows what he's talking about. He's not a chef that's all flash and no substance. So when he said that "traditional" French onion soup didn't start with beef stock, I didn't slam the book shut and say that he didn't know what he was talking about. Instead, I took the challenge and made the soup. This isn't a quick recipe. The onions cook for a looooong time. But that's great on a chilly fall day when you want to warm the kitchen. Most of that onion-cooking time is hands-off while the liquid cooks away. At the beginning and end of cooking, you need to pay more attention to it, though. The onions can be cooked ahead of time, and the soup can be finished very quickly on another day, if you prefer. This looks like a lot of onions when you start, but they cook down to very little. When I started, my 5 1/2 quart Dutch oven was overfilled. When the onions were done cooking, there was less than a pint of onions left. Melt the butter in a large, heavy-bottomed pot. Add the sliced onion, sprinkle with 2 teaspoons of salt, and cover the pot. Cook on medium heat until the onions have heated through and have started to steam. Uncover the pot, turn the heat to low, and continue cooking until the onions have released their water, the water has evaporated and the onions are an amber brown color. Stir as needed to keep the onions from sticking. In the middle of the cooking process, when the onions are swimming in liquid, you don't need much stirring. Once the liquid has disappeared and they are beginning to turn brown, you'll need to watch them carefully. This process can take 5 hours or more if you cook at a very low temperature. Add a few generous grinds of pepper. Once the onions have cooked down, add 6 cups of water and raise the heat to high and bring the soup to a simmer, then reduce the heat to low. Add the sherry and taste for seasoning, and add salt and pepper, as needed. If the soup is too sweet, add a little vinegar to balance it. If you want more depth of flavor, add a splash of red wine as well. Meanwhile, preheat the oven to 200 degrees and place the bread slices in the oven to dry completely. You can do this ahead of time and leave the bread in the oven - it shouldn't burn at this low temperature. To serve, ladle the soup into small oven-safe bowls. Top with one or two slices of bread, as needed, to cover the soup. Cover the bread with grated cheese. 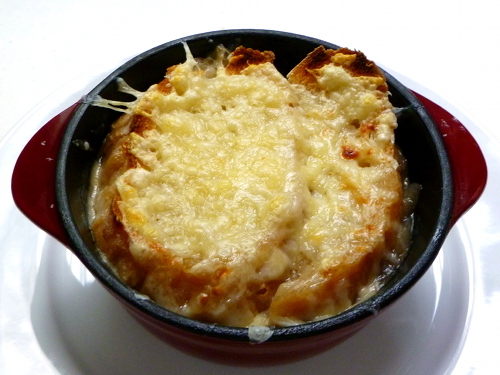 Put the bowls under the broiler to melt the cheese and brown it a bit. Serve immediately. When I peeked into my Fooducopia basket of "what to use next" and saw the bottle of cinnamon from Keres Spices, my first though was "Cinnamon Rolls!!!" That was quickly followed by "Apple PIE!!!" and then "Cinnamon Bread.!.!.!.!" And then I took a breath and realized that all of those were way too ... expected. When I start with an ingredient that I want to feature in a recipe I'm creating, I like to find more interesting - and possibly unexpected - uses. Sure, I could have made a nectarine pie with cinnamon, or I could have made apple-cinnamon sweet rolls, but I decided to skip the sweet and go savory instead. Yes, savory. Cinnamon is one of those spices that works in both sweet and savory dishes. Trust me. And while we're talking about cinnamon, did you know there are two completely different spices sold as cinnamon? One is actually cassia, and then there's true cinnamon. Most bottles of cinnamon don't specify. Which is fine. Unless you're a spice nut, you can use them interchangeably, anyway. Just make sure you cinnamon (like any spice) is fresh. If it smells like vaguely cinnamony sawdust, it's time for a new bottle. This recipe starts with a spice mix and I used it to cook some pork ... but this mix can be used on other things as well. Try a sprinkle on squash when you roast it! Combine the salt, allspice, cinnamon, chili powder, and sugar in a small bowl. About 1/2 hour before you want to cook, take the pork out of the refrigerator and let it rest at room temperature. Coat the pork chops generously with the spice mixture. Let them sit for a few minutes, and you'll see that coating will look damp instead of dry. Meanwhile, put a skillet on medium-high heat and add about a tablespoon of oil. Heat the oil until it's not, but not smoking. Coat the chops lightly with the flour, and shake off the excess. Place them in your heated pan and cook until nicely browned on one side, then flip and cook on the other. Continue cooking until the chops are cooked all the way through, but not overcooked and dry - cooking time will vary depending on how thick the chops are, and how hot you're cooking them. I had fairly thin chops and they were done at about the same time both sides were browned. If you have thick chops, consider finishing them in the oven to keep from over-browning the coating. Let the chops rest for about 10 minutes before you slice or serve. I served this with roasted acorn squash and a salad of fresh corn, roasted red pepper, zucchini, capers, and tomatoes. Before I got a review copy of Stir-Frying to the Sky's Edge, I never thought about stir frying anything with eggs. I mean, okay, eggs in fried rice ... but certainly not in a shrimp dish. For me, that's a great reason to try a recipe. I always like to try new things, whether it's a new technique or a new flavor combination, or a new gadget. Stir frying eggs and shrimp was a new idea and sort of a new flavor profile. I've had shrimp in egg foo yung, but that's a different concept. Velveting is a Chinese technique, but these aren't velveted in the traditional sense. The result, though, is similar. Yet another new technique to add to my arsenal. When I went shopping for shrimp, I was faced with some interesting choices. This recipe called for small shrimp, and of course small is a relative term. But the small shrimp were all from countries I prefer not to buy seafood from. There was one option for US sourced shrimp, but they were large shrimp. Interestingly, when I looked at the price per pound, it was actually a better deal than for all but the really miniscule shrimp. So I bought the big ones. For many recipes, large shrimp seem preferable. Or at least they look more generous. But with a stir-fry recipe, timing is important. You don't want to have big pieces of shrimp that take too long to cook. So I cut them into pieces that I thought would approximate the small shrimp the recipe called for. Problem solved. Combine the shrimp, 1 teaspoon of egg white, cornstarch, 1/2 teaspoon of rice wine, and 1/8 teaspoon of salt in a medium bowl. Stir until the cornstarch is completely dissolved. Stir in one teaspoon of the oil. Put the shrimp in the refrigerator, uncovered, for 15 minutes. Remove it from the refrigerator and let it come to room temperature - about 15 minutes. Meanwhile, beat the eggs, pepper, remaining 2 teaspoons of rice wine, and 1/4 teaspoon salt in a small bowl. Heat a 14-inch wok or 12-inch skillet on high heat until a bead of water vaporizes within 1 to 2 seconds of hitting the pan. Swirl in the remaining 2 tablespoons of oil, add the scallions and ginger, and stir fry for 10 seconds, until the aromatics are fragrant. Add the shrimp and stir fry for one minute, until the shrimp start to turn color but isn't fully cooked. Add the peas. swirl the egg mixture into the wok, and stir fry for another minute until the shrimp are cooked through and the eggs are just set but still moist. Cut the zucchini, squash, and cucumber into a medium dice. Slice the scallions thinly. Remove the seeds and any errant bits of skin from the red peppers, and dice them. Combine the warm pasta with the vegetables. Break the chevre into pieces, and add it to the pasta and vegetables. Stir to combine. Taste, and add salt, as needed. Drizzle with a bit of olive oil to moisten the mixture, as needed. Refrigerate until chilled. Serve cold, or at room temperature. Before I moved to Colorado, I lived in, near, and around Chicago. So every once in a while, I crave the kinds of food that was readily available everywhere in Chicago, but is less available here. High on that list is the Italian Beef Sandwich. And yes, the sandwich sometimes needs capital letters. There are a few places around here that sell Italian beef sandwiches, but in the Chicago area, they're so ubiquitous that the name of the sandwich is recognizable even when it's shortened. Tell someone you want to go out for some beef sandwiches - or even just beefs, and they'll know what you mean. You're not looking for a roast beef sandwich, and you're not looking for a French dip. Well, okay, a French dip is similar to an Italian beef sandwich. But it's not the same. If you're craving an Italian beef, a French dip isn't going to satisfy that craving. There are six critical components in the proper beef sandwich. First is the beef. You can use different cuts of meat. I've even been known to use left over rib roasts. But an Italian beef is cheap eats. A rump roast or top or bottom round is perfect. They key, though, is thin slices. I use an electric meat slicer to make sure the slices are thin enough. If you don't have one, then it takes some care to slice it as thinly as you possibly can. The second important component is the bread. You need something sturdy. A baguette or French bread is what you need. A soft, squishy loaf won't work. Third is the sweet peppers. Here, we're talking about green bell peppers. It's a classic addition to a classic beef sandwich. Not everyone asks for them on their sandwich, but they are a standard item. Fourth is the hot peppers. If you ask for an Italian beef sandwich in Chicago, hot giardiniera peppers are always an option. Again, not everyone asks for them, but a beef with "sweet and hot" is a typical order. Unfortunately, the brand of peppers served in Chicago is hard to come by in Colorado. But that's okay, I found an acceptable substitute. Fifth is the juice. Or gravy. Or whatever you want to call it. The slices of beef swim in a flavorful broth, and it's as important as the beef or the bread or the peppers. I've made beef sandwiches from left over roast beef, but then I need to come up with a broth or stock to use. If you're starting from scratch with the intention of making beefs, braising a tough cut of meat gives you tender meat and plentiful broth as well. Sixth and last is the assembly. A beef sandwich is not a dainty sandwich. It's a messy thing. There shouldn't be slices of beef laid flat in the bread - you should have pillows and piles of thinly slices beef stuffed into the sandwich, with as much of the peppers as you like. The last step is to ladle juice onto the sandwich so the bread soaks up the juice. Or you can dip the whole sandwich into the broth. And that's why you need a sturdy bread - something that starts off soft will simply disintegrate. Beefs are usually substantial enough that they don't require any side dishes, but when there is one, it's usually French fries. I decided to make something a little healthier. This whole recipe is a two-day process. The beef cooks ahead of time and gets chilled and refrigerated before slicing and the dough gets made ahead and baked the next day. The giardiniera is better if it's made ahead of time. The sweet peppers can be made ahead of time or the same day - whatever works best for you. The easiest way to cook the beef is in a crockpot, and it even better if you've got a crock pot that has a browning feature, it's even better. You can also cook it in a dutch oven, but it requires a little more attention. Heat 1 tablespoon of olive oil in a heavy bottomed pot or in your crock pot, if it has a browning function. Salt the meat lightly, then brown it on all sides. Add 1 tablespoon of oregano and the garlic cloves. Add water to just under the top of the meat - in my pot it was about a quart. Turn the heat to low - or turn the crock pot to a low cooking setting, cover the pot, and cook until the meat is fork-tender - from 4-8 hours, depending on the shape and size of the meat, and your particular crockpot. When the meat is tender, remove it from the pot and put it in a storage container that will hold the meat and the cooking liquid. Strain the cooking liquid to remove the spent oregano and garlic and add the liquid to the storage container. Refrigerate until the meat is fully chilled - over night is ideal. The next day, remove the meat from the container and slice as thinly as you can. Add it to the cooking liquid, add 1 teaspoon of oregano, and heat gently. Taste for seasoning, and add salt as needed. Cut the peppers in half, remove the stem, core and seeds, and slice them into thick slices. Heat the remaining tablespoon of oil in a frying pan and cook the peppers until they begin to soften - but you don't want them to brown. Add some of the beef cooking liquid - about 1/2 cup - and cover the pan. Simmer until the peppers are fully cooked - they should be soft and a little floppy. The giardiniera from the olive bar will likely have very large pieces of cauliflower along with smaller pieces of vegetables. Cut them all into smaller pieces, to match the size of the peppers from Mmlocal. Combine the deli giardiniera with the hot pepper (and all their liquid) and stir to combine. This should fit nicely in a pint jar. Refrigerate until needed. This is fine right after it's combined, but will be better after the flavors meld, so make it a day or two in advance, if you have time. Cut the French bread into sandwich-sized lengths, the slit lengthwise, but not all the way through. Pile on the hot meat, top with peppers, and then ladle on some extra broth until it's as soggy as you like it. This isn't exactly the same as the bread in Chicago, but it's close enough. Combine all of the ingredients, except the olive pil. Mix until combined, then knead until the dough begins to get elastic - you can do your kneading in a stand mixer, bread machine, by hand, or with a food processor. Drizzle a bit of olive oil in a plastic bag and transfer the dough to the plastic bag. Squeeze the air out of the bad and refrigerate overnight. The next day, remove the dough from the refrigerator, let the air out and reseal the bag, and let the dough rest on the counter for an hour to warm up a bit. Preheat the oven to 375 degrees and line a baking sheet with parchment paper or sprinkle with cornmeal. Flour your work surface and divide the dough into 2 pieces. Form each piece into a rope about 12 inches long. Place the logs on the prepared baking sheet, leaving space between them for rising. Cover with plastic wrap and set aside to rise until doubled, about 45 minutes. Remove the plastic wrap, slash the top of the loaves as desired, and bake at 375 degrees until nicely browned, about 30 minutes. Let the loaves cool completely on racks before cutting. Check the next post for the pasta salad.